Research partnerships between scientists and K-16 students, teachers, and the general public can increase our collective understanding of the Earth system while making the science by which we understand the Earth accessible to all. Partnerships promoting authentic research integrate inquiry-based educational approaches with innovative research questions. Such partnerships serve as effective vehicles for teaching scientific logic, processes, and content, while allowing students to participate fully in scientific investigations. Benefits to the scientists include data collection and analysis that may be difficult to gather with limited human resources, and an opportunity to engage the next generation of scientists. Benefits to the students and teachers include a learning process that fosters creativity, sets high standards, teaches problem solving, and is highly motivating. When closely aligned with the National Science Education Standards, research partnerships should be an integral component of science education reform at all levels. This potential will be achieved only if partnerships are effectively evaluated from both pedagogical and scientific perspectives, and best practices are widely disseminated and supported by both scientific and educational communities. Dixon Butler Director and Ian MacGregor The GLOBE Program, Suite 800, 1800 G St., Washington, D.C.
GLOBE is a science and education program designed to use environmental research as a means to improve student achievement in basic science, mathematics, geography and use of technology. Fundamental to the process is linking students and scientists as collaborators. Approximately 8,000 U.S. schools and 3,500 schools from 96 countries are GLOBE partners. GLOBE trains teachers to teach students how to take measurements of environmental parameters at quality levels acceptable for scientific research. Teacher training emphasizes a hands-on, inquiry-based methodology. An annual review over the past 6 years indicates that GLOBE has had a positive impact on students' ability to use scientific data in decision-making and on students' scientifically informed awareness of the environment. GLOBE Protocols are aligned with the National Science Education Standards. By performing multidisciplinary hands-on science research, 6-10 highschool students each year develop their critical thinking, logical reasoning, scientific writing and presentation skills. Supervised by Williams College Electron Spin Resonance (ESR) Lab staff, students prepare teeth and other fossils from archaeological and paleontological sites for ESR dating. They are involved in the all aspects of the research, except those directly involving radiation, from selecting and preparing the fossil samples for dating, to running the Williams ESR spectrometer, and calculating ages. Mentored by the scientists, students prepare detailed reports to publish in scientific journals and present their data at scientific conferences, science fairs, and to science classes in their home schools. The excitement of NASA, space exploration, and robotic missions provides a natural entry point to engage students in learning about math, science, and technology. Pairing them in a research partnership with scientists and engineers allows them to discover real world applications for that knowledge. Over three years, the LAPIS program has involved students in active, hands-on research with the prototype rover for the 2003-2004 Mars Exploration Rover mission and scientists associated with its Athena Science Investigation. The result has been an experience that positively impacts the scientists, teachers, and students involved, and provides additional information on using the rover to acquire scientific data. Using a participatory evaluation process, empowerment evaluation, the participants have helped improve the program and provided a model for an outreach program associated with the twin rovers of the 2003-2004 Mars mission, the Athena Student Interns Program. The Moonsnail Project engages middle school students in discovery and the process of science by making them collaborators with scientists in the investigation of a genuine scientific hypothesis. During summer 2001, teachers from 14 coastal schools around the U.S. (Alaska, Washington, Oregon, New Jersey, North Carolina, Georgia and Florida) learned about the ecology and paleoecology of marine ecosystems and how to involve students in the collection and analysis of data to document the spatial variation of moonsnail drilling predation. Thirteen of the fourteen participating teachers (93%) from the first workshop incorporated the Moonsnail Project into their curriculum and have actively pursued the collection of data for research. In essence, the students in this project are participating in a research collaboration with other participating schools and scientists, using their data to test existing hypotheses about naticid predation and hypotheses that they develop about marine ecology and paleoecology. Students share their data electronically and communicate with scientists and each other using the project web site. In addition, a scientific conference was held in summer 2002, at which students presented the results of their research and teachers shared their curriculum and experiences. This conference also provided a vehicle for assessment of student learning outcomes. It is clear from reports from teachers and students, as well as newpaper articles, that teachers and students are extremely motivated by participation in a real scientific investigation, and that this excitement has extended to parents and the entire community. An important long-term goal of science education reform is to involve more students in open-ended inquiry and authentic research. In making such "research partnerships" between scientists and students commonplace, it is critical to determine how to attract willing participation of a large number and variety of classrooms while achieving genuine scientific goals. Since early 2000, the Paleontological Research Institution and Cornell University have been administering a research partnership involving non-specialists in collecting and sorting fossils from sediments collected around recently excavated mastodon skeletons. This research partnership quickly drew a diversity of participants from across the country. Feedback on participation in this project has been extremely positive, and student discovery has yielded a large reference collection of small fossils that otherwise may not have been recovered. Based on feedback in surveys and letters, oral discussion, and other observations, we surmise that this project is popular because of the mystique of large vertebrates and because of the knowledge that this project is "authentic." Ability for non-specialists to participate is enhanced because the activity is simple to undertake, requires little equipment, is intellectually straightforward, and is open-ended enough to readily adapt to other curricular goals. The Nevada Science Teacher Enhancement Project (N-STEP) was a three-year Teacher Enhancement program funded by the National Science Foundation. Fifty high school teachers worked closely with research scientists, education faculty, and 74 high school students on authentic field-based research projects in geosciences, biologiacal sciences or social sciences. Major program goals were to increase teachers understanding of authentic scientific research, improve teachers content knowledge, foster closer professional collaboration between high school teachers and research scientists, and help teachers better incorporate research into classroom teaching. Increased involvement of high school students in authentic research was another goal of N-STEP. Scientists involved in the project generally found data collected to be high quality and suitable for inclusion in their research. Annual formative evaluation of the program led to improved satisfaction of teachers and students with their experiences. Results of two quantitative instruments found no statistically significant changes in participant understanding of the nature of science as a result of their experiences. K-12 educators teaching earth science presently face a unique opportunity to engage students in community-based studies of environmental problems because of the recent focus on environmental issues in the geology profession and new national education standards encouraging inquiry-based learning and community outreach. The Washington Earth Science Initiative, a K-12 teacher enhancement program in Washington State, is providing teachers the background knowledge, human and materil resources, and time to develop community-based studies on flooding, salmon habitat restoration, groundwater resources, earthquakes, volcanic hazards, and other environmental issues facing the citizens of Washington. During an intensive three-week summer institute teachers learn how to use and acquire a range of research resources such as topographic maps, aerial photographs, survey equipment, and computers so they are able to conduct long-term research projects with their students. 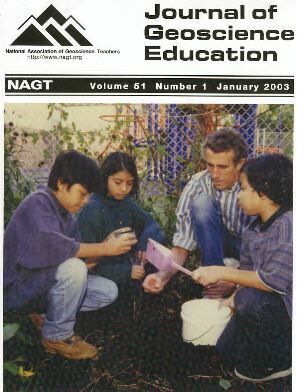 Teachers also employ a number of pedagogical techniques modeled during the institute to create a series of inquiry-based activities that provide their students with the background knowledge and skills necessary to conduct the research. A number of community representatives give presentations and lead field trips early in the institute to demonstrate to teachers the range of organizations involved in environmental studies and their willingness to work with teachers. This motivates the teachers to contact other organizations near their schools later in the institute and the teachers are often surprised to find how willing these groups are to work with them in developing long-term projects. While the community-based K-12 projects are of great value to teachers, students, and the community, the collection of authentic research results useful to community leaders has been limited by numerous school district constraints and the lack of existing data collection efforts by community leaders that could benefit from student and teacher participation. A pilot of a field-based, research experience in Earth Science teacher education program was conducted for a cohort of secondary science teachers from Prince George's County, Maryland. The goal of this M.Ed. degree program at Loyola College in Maryland was to produce well prepared, scientifically and technologically literate Earth Science teachers, through a teaching- and research-oriented partnership between in-service teachers and university scientist-educators. Program participants were exposed to a broad background in field-based instruction in physical, historical, and environmental aspects of Earth Science content and teaching methods, followed by participation in an authentic, technology-rich field research project. Attrition rates were initially high, as some participants had difficulty with the logistics and conditions of working in field settings. The pilot program was successful, however, in achieving its goal of preparing quality Earth Science teachers through field research experiences. Participants have become confident and innovative in their Earth Science teaching and have developed effective field-based curricula for their own classrooms. The participants have published and presented the results of their societally-relevant geologic study at national and international conferences, contributing to the body of Earth Science knowledge, locally and globally. Science progresses whenever new ways of explaining natural phenomena are revealed. New ideas can only be put to use after the results and significance of research have been brought to the attention of both the scientific and lay communities. The Milwaukee Public Museum Dig-A-Dinosaur Program is a model for scientists who want to conduct research as well as engage and educate the public in their field of study. An array of rewards is derived from including amateurs as members of a research team. Such collaborations strongly increase interest in and comprehension of science. Active participation in scientific investigations promotes one's ability to grasp the logic employed to construct scientific knowledge. Derivative to this, people who participate in research, enthusiastically share what they learn with diverse audiences. Moreover, the productivity of the scientist can be significantly increased, as exemplified in an extensive paleoecological research project conducted by the authors. In retrospect, the project provided an educational experience for the volunteers that should have been formalized. It would certainly be appropriate to earn college credit based on participation and formalization would validate this learning experience. Student-scientist partnerships (SSPs) can be beneficial collaborations for both students and researchers. Students learn scientific processes through direct involvement in research, while scientists gain access to data otherwise unobtainable due to the human resources necessary for its collection or analysis. Students are highly motivated to participate in SSPs by the knowledge that they are collaborators in authentic research. Thus, failure to use student data, resulting from concerns about the accuracy of student observations, may undermine student science experiences. A lack of confidence in student data may also make it difficult to leverage scientific support for, and interest in, these types of partnerships. The Paleontological Research Institution is developing and pilot testing an SSP that involves 4th-9th grade students in paleontological research on Devonian marine fossil assemblages. Formative data assessment shows that, despite numerous misidentifications, rank order of fossil taxonomic abundance may be documented by students. Correlation tests between student abundance data and data generated by project scientists are statistically significant for most comparisons. Assessments of data quality allow project staff to tailor research questions and classroom materials to better fit the educational needs and abilities of students while contributing data of sufficient accuracy to partnering scientists. This paper reports findings of the first year of a three-year summer geoscience program funded under the National Science Foundation Research Experiences for Undergraduates (NSF-REU) initiative. In this program, undergraduates and high school teachers work with a consortium of faculty from five southern colleges and universities. Eight undergraduates and four high school teachers engaged in four research projects initiated by faculty teams. This paper examines the effect of the program on the participants' interest in research, career plans, and attitude toward science. Participants working on three projects increased their interest in research, with two thirds of the participants changing career plans to become more research oriented. They reported that they enjoyed being part of authentic research in which they could take initiative and felt a sense of ownership in their projects. Due to less faculty availability, the fourth group had less opportunity to function as genuine partners in research. While participants in this group appreciated the opportunity to luse sophisticated instruments, they had little change to test their own ideas and gained only a limited understanding of how their tests fit into the research. Their interest in research did not increase. Implications for providing authentic research opportunities are discussed. Through the Earth System Scientist Network project we are working with scientists to facilitate the meaningful participation of students in their research projects. In these projects the scientists can take advantage of having an extended research team, and the students and teachers can contribute to a research project while developing skills in inquiry and expanding content knowledge in Earth system science. In order to successfully achieve these partnerships the development of each research project requires the scientist and development team to address a series of issues. These include identifying the scientific research questions, the data that the students will analyze, the requirements for participating schools, the tools and protocols that the students and teachers will use during their research, logistical issues such as assuring that all the instruments and tools are available to the teachers and students, the background information and training they will need, additional research questions that can help spark the interest of students and encourage them to ask their own question, and meaningful recognition of students and teachers for their contributions to the research projects. The Collarobration to Advance Teaching Technology and Science (CATTS) is a program to develop sustainable partnerships with Kindergarten through 12th grade level (K-12) educators to improve science, mathematics and technology education at all levels. The partnerships bring together faculty and students at the University of Arizona with teachers and their students from six local school districts. In grades K-6 these partnerships typically work to increase the amount of science inquiry used in the classroom by helping teachers adopt and implement inquiry-based curriculum. In grades 7-12, the program also focuses on increasing the use of inquiry, but often does so through short- and long-term research experiences for students. CATTS partnerships are effective because they benefit all stakeholders. CATTS creates opportunities for graduate and undergraduate students (the CATTS Fellows) to learn effective teaching practices and to be active participants in K-12 education. School districts and University of Arizona outreach programs benefit when CATTS Fellows work on projects that address identified educational needs in K-12 schools. K-12 teachers and students benefit from the additional classroom assistance and resources provided through the CATTS program. This paper will focus on the design of our program and the conditions necessary to establish and maintain partnerships that promote inquiry and research in schools. The first two years of the project taught us the importance of communicaton to foster mutual respect and understanding of our shared goals. A high degree of coordination and sensible logistics are also critical to the success of a complex project such as CATTS. Only after communication and coordination is well established is it possible to engage K-12 teachers and their students in inquiry and research. The Collarobration to Advance Teaching Technology and Science (CATTS) program supports a variety of partnerships that bring faculty and students at the university level together with K-12 teachers and their students to promote short- and long-term research projects as well as inquiry science and mathematics lessons in K-12 classrooms. Our goal is to improve science, mathematics and technology education in grades K-16. Continuous program evaluation provided critical information about how well the partnerships were developing and their overall impact. We were able to use the results of surveys and journal writings to make important improvements to our preparation workshop and our communication with school partners over the course of our first and second year, and continue to do so. These same instruments provided documentation that the program was having the desired impact on the attitudes and teaching practices of university and school partners to communicate their goals and expectations effectively. The lessons learned in designing and implementing the CATTS program can be applied directly to building research or any other kind of partnership with schools.